NORTH VENICE, Fla.–(BUSINESS WIRE)–PGT Innovations (NYSE: PGTI), a national leader in the premium window and door category, recently participated in Manufacturing Day and welcomed area students inside its North Venice facility as part of National Manufacturing Month in October. 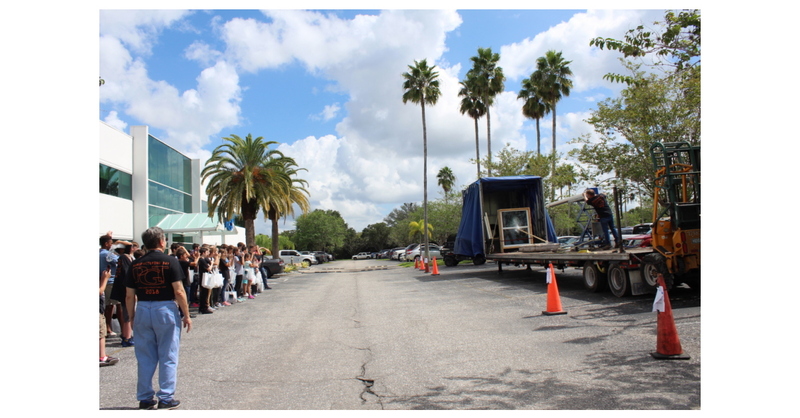 On Friday, Oct. 5, PGT Innovations hosted a total of 85 students from Laurel Nokomis Middle School, Woodland Middle School, North Port High School and Venice High School. During the approximately 3-hour field trip, students toured the facility, participated in 3-dimensional modeling and screen building and observed a product being tested for impact resistance. During the impact test, a 9-pound, 8-foot-long two-by-four lumber missile was shot out of a compressed-air cannon at 50 feet per second (34 mph) at a window. This is one of the three stringent tests that the company’s products must pass inside an independent testing lab in order to be classified as impact resistant. Students were also treated to a lunch at the PGT Café and received a t-shirt and goodie bag before boarding buses back to school. PGT Innovations manufactures and supplies premium windows and doors. Their highly engineered and technically advanced products can withstand some of the toughest weather conditions on earth and are revolutionizing the way people live by unifying indoor and outdoor living spaces. PGT Innovations creates value through deep customer relationships, understanding the unstated needs of the markets it serves and a drive to develop category-defining products. PGT Innovations is also the nation’s largest manufacturer of impact-resistant windows and doors, holds the leadership position in its primary market, and is part of the S&P SmallCap 400 Index. The PGT Innovations’ family of brands include CGI®, PGT® Custom Windows & Doors, WinDoor®, Western Window Systems and CGI Commercial. The company’s brands, in their respective markets, are a preferred choice of architects, builders and homeowners throughout North America and the Caribbean. Their high-quality products are available in custom and standard sizes with massive dimensions that allow for unlimited design possibilities in residential, multi-family and commercial projects. For additional information, visit www.pgtinnovations.com.